The first thing that anyone will notice about Ungava Gin is that color. That electric neon yellow color. Surprisingly, no this isn’t a bottle of Suze. The color is from the infusion of the six arctic plants that make up Ungava’s unique botanical bill. The base spirit is local corn and the six arctic botanicals range from the relatively common— Rosehips for example. And the go all the way to the obscure such as the Bakeapple or Labrador Tea. These botanicals are handpicked during their peak season and imparted in two passes: once before distillation, and again afterwards via infusion, hence the color. Along the way, Ungava, despite controversy over its use of Inuit imagery (the company has since apologized), it’s quickly gained a global following and has become one of the top selling Canadian distilled gins and has won a bunch of awards. It’s still an intriguing gin and worth a closer look, for both the obscure botanicals, the color, and its taste. Wild Rose Hips is another one, and this is probably familiar to anyone who’s had a rose bush. It’s the fruit of said plant, and been used for jellies, teas and are very rich in vitamin C.
Now we’re getting into the ones that I’d never heard of before. Arctic Blend is a creeping evergreen used as a kind of tea by northern peoples. Labrador tea is a flowering bog plant with white poofy flowers also used as a tea by the Inuit. 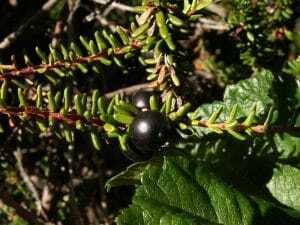 Crowberries are another evergreen of the north, and these low lying plants produce round purplish berries that are used in jams and pies as well. A lot of tart/semi-sweet fruits in here. Let’s get on to the taste. The color out of the bottle is an almost otherwordly shade of sun-kissed yellow. The nose is a rather traditional from the start, but with a distinct ethanol edge. A touch of citrusy lemon, a touch of floral, but a good deal of juniper. The color may surprise, but the nose feels very classic. The nose is slightly sweet, a hint of lemon zest but a good deal of juniper. A hint of alcohol as well. Smells quite classic in character. The palate deviates a bit from the expected path. A distinct note of coriander seems to emerge, with some hints of fresh cranberry, preserved lemon and a muddied, green/pine juniper. There’s a tangy earthiness that billows here underneath the surface buoyed by a slight touch of green tea leaves, flower imbued tea blend and tart berry. 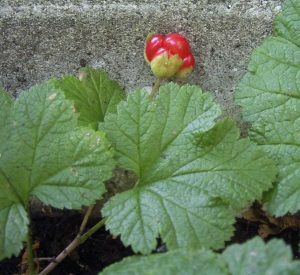 Could that be the Cloudberry? The finish is medium length with a mostly warm astringency and a hint of juniper and pine again. It’s an intriguing gin with a complex flavor profile that at times oscillates between opaque and traditional. I first mixed it with some 1724 tonic. The beverage has a lovely golden tone to it. The tonic really emphasizes the bitter notes of the Ungava. It tastes exceptionally dry. In an odd way this combination makes for a Gin and Tonic that might be to the liking of those who are fans of more bitter drinks. There’s a touch of sweetness, but this is certainly not the Gin and Tonic you’re used to drinking like a sugary sweet soda. Very interesting the way certain notes come out here. Nice. I mixed it up in a Negroni, and you get a nice bit of juniper and bitterness here, but the finish is slightly different than expected: a bit of tart berry and floral notes come out at the end. Quite surprising as I found those notes to be very understate neat, but quite interesting that a complex drink like the Negroni would bring them out. The martini again shows a slightly different side of this gin: the citrusy tang comes out a bit, berries and sharpness compliment the herbal notes of Vermouth very nicely. The finish is clean, dry, a bit bitter, but overall very nice for a martini. Highly recommended. Ungava is a unique contemporary gin. The combination of creative ingredients and bathtub-gin-style-infusion culminates in a gin that will have both supporters and detractors among contemporary and classic gin enthusiasts. The obscure flavors and ingredients will leave you wondering, “just what is that flavor?” and reaching for more traditional supports “is that coriander?” But its mixability and unique color will probably have you reaching for it again. It mixes nicely in cocktails and the color actually adds a stunning touch to many of your standard cocktails (like the Alexander for example…) I suppose the TL;DR of it is that it’s unique and well made, combining surprising techniques into an eye-catching gin that spans taste preferences. Try before you buy, but I won’t blame you if you go all in on color alone. I bought a bottle in the Maldives of all places and it now resides with me in the UK – it has become truly international! Oh and it is delicious. At last the educated are now even more so. Well done! Try it in a martini with a sprig of basil. Brilliant! I was fooled by the colour and the story on the fancy bottle; this gin has very little flavour – if you expect there to be some bitterness from the Juniper. With a small amount of tonic you can’t taste the gin at all. Perhaps it is not made for G & T – only for cocktails, or straight – but then you take a lot of alcohol. I bought it in a duty free to drink while overseas – the only advantage is I am drinking less gin than usual!! Bought a bottle at the duty free shop at Schiphol/Amsterdam airport. €30 for 1l bottle. Took it to Iceland. Seemed a fitting backdrop for this gin. It’s not Cree, it’s Inuktitut. Ungava is from the north of the province of Ontario, where the Inuit live. Just picked up a bottle in Parisian Supermarket so it’s made it over here now, looking forward to trying it. Ungava is North of the Province of Québec, not Ontario. First thing I thought while tasting it was being surprised as the very classic “base level” gin taste that I’ve grown to love. Got my first bottle this month, I enjoy it with 2:1 ratio of club soda:Ungava poured over rocks with a twist of lime. It can be a lot closer to vodka than the craft gins I’ve been enjoying on Vancouver Island. Still very enjoyable. Bought the bottle at Paris duty free airport at 25€ in promo instead of 31€. Mix a little with some vodka (Smirnoff) on the rocks. Great drink!